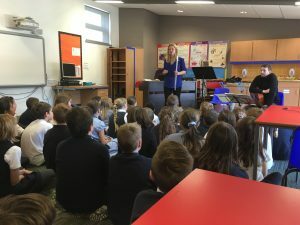 The P4/5 and P5/6 classes had their final Pitch, Pulse and Magic visit today! 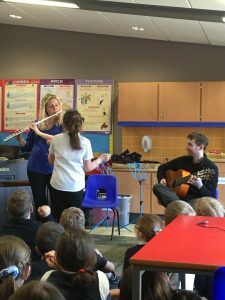 Find out more here.. Primary 4/5 and Primary 5/6 have been very lucky this year to have been visited by some fantastic musicians who have been able to pass on some of their amazing knowledge and skills! 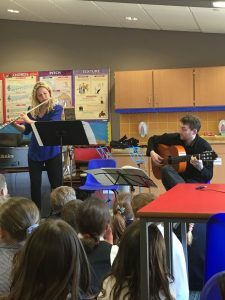 Today’s visit was the last of three and focused on the flute playing of Yvonne and the flamenco guitar playing of Andrew. 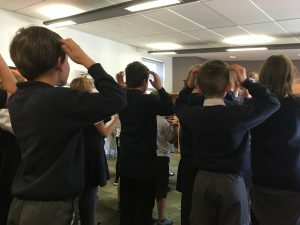 Both classes were in awe of the music and instrumental ability that our visitors delivered but still found time to listen intently, take part in a beat themed warm up activity and then, most exciting of all, conduct our two visitors! This was achieved by chosen boys and girls raising or lowering their left hands to alter the volume of the piece and by moving their right hand to change the speed.